A gold Vienna Philharmonics coin is a coin first struck in the best European traditions in the purest gold form of 24 karats in 1989 and is now available in four sizes. These Austrian gold proof coins were the best selling gold bullion coins in a number of years around the world, in 1992, 1995 and 1996. The Gold Vienna Philharmonics coins are proudly embellished with the musical instruments that play an integral part in world’s renowned Philharmonics Orchestra of Vienna. The face surface of the coin bears the image of the Central Hall of the Vienna Philharmonics Orchestra called Musikverein. The unique design, beauty and exceptional gold content of Gold Vienna Philharmonics coin that is the only European coin that is denominated in Euros make this coin one of the most preferred gold investments and coveted additions to any numismatic collection. In addition, the fact that Gold Vienna philharmonics coin was recognized as a legal tender for two different currencies, Austrian shillings in the past and Euros in the present adds to the uniqueness of this coin. 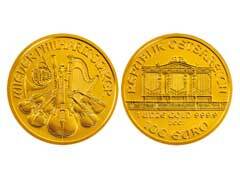 It also the only European bullion coin that exercises its legal tender. The gold Vienna Philharmonics coins are minted in four different sizes, namely, a full ounce, half an ounce, quarter of an ounce and the smallest size of a tenth of an ounce. These coins also have various face values in Euros starting from 100 Euros in a full ounce coins and 50, 25 and 10 Euros respectively. This allows investors and collectors a great selection to fit their needs and wants. Relatively low premiums for these coins ranging from 3-9% per one ounce coin depending on where you buy your coins are an added bonus allowing you to maximize your investment dollar potential. Did you know that in 2004 15 massive Vienna Philharmonic coins were minted, each weighing in at massive 1,000 troy ounce with denomination of 100,000 euros making them one of the largest bullion coins in the world? If you would like to enrich your numismatic collection or invest your hard earned dollars in a true currency that had been tested by time, the Vienna Philharmonics are the way to go to insure safe and secure investment for years to come. Take care to buy these and other certified gold coins only from reputable sources to avoid gold market scams. If you are willing to learn more about other gold coins like, for example, German gold coins, check out our other articles on the website.